A Year of Being Here: Linda Gregg: "A Dark Thing Inside the Day"
Linda Gregg: "A Dark Thing Inside the Day"
and this morning it is easy to understand. and high above that a brilliant clear sky. The roses are blooming and I smell the sweetness. Everything desirable is here already in abundance. in the leaves, under the sheen. We sleep easily. So I bring no sad stories to warn the heart. 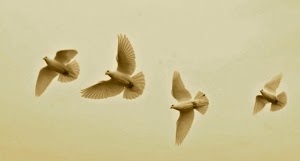 world gives and the white doves praise all of it. "A Dark Thing Inside the Day" by Linda Gregg, from All of It Singing. © Graywolf Press, 2011. Art credit: "Doves fly in formation outside the farm," photograph by Rich Cooley/Northern Virginia Daily (originally color). Jane Gentry: "On a Perfect Day"
Ellen Bass: "And What if I Spoke of Despair"
Naomi Shihab Nye: "Words When We Need Them"
John O'Donohue: "The Inner History of a Day"
Nina Alvarez: "If You Could Be Soft"
Ingrid Wendt: "Give Us This Day"
Jeanne Lohmann: "Shaking the Tree"
Ralph Murre: "The Light This Day"
Julia Fehrenbacher: "Hold Out Your Hand"
John Glenday: "Concerning the Atoms of the Soul"
Ted Kooser: "Porch Swing in September"
Wendell Berry: "Enriching the Earth"